1950s Winky Dink and the 21st century version. This morning I ran across a mention of a TV program from the ’50s that brought back some fond memories. The program probably innovated interactive entertainment, a TV program that even Bill Gates once saluted as a revolutionary use of the medium — a 1950s show called Winky-Dink And You. The program was designed to be interactive (though I doubt that word was used in those days) and required kids to order a special kit through the mail. It included a piece of clear flexible plastic, which was called a ‘magic window’, along with some special crayons. The idea was that kids would use static electricity to stick the plastic over their TV screen, then use their crayons to help Winky-Dink out of a jam each episode by drawing whatever Winky needed (rope, ladder, bridge, etc.) on the TV screen, and to trace letters on the screen at the end of each show to read a secret message. The Winky-Dink Kit was sold by mail for fifty cents, and I can assure you that I willingly parted with the money for one of my own, as did millions of other kids all across the country. 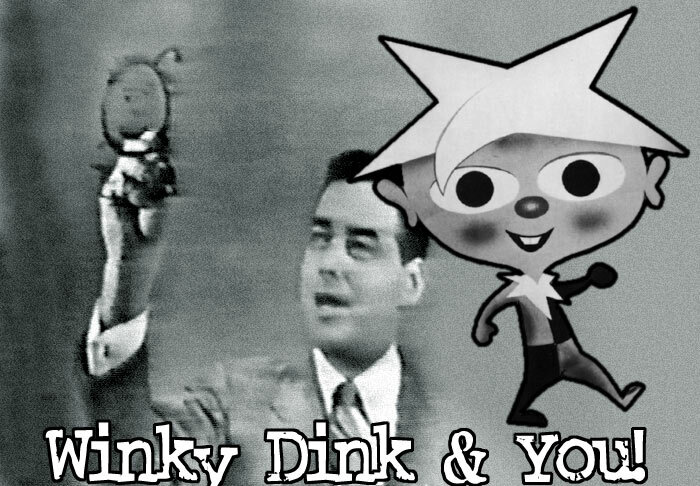 Winky-Dink and You originally ran at 10:00am Saturday mornings from October 10, 1953 until April 27, 1957 on the CBS network. 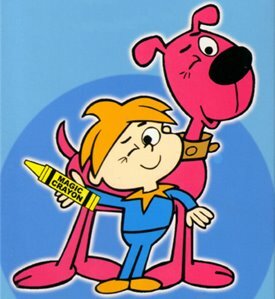 Broadcast in black and white, the program featured the adventures of a star-headed cartoon lad named Winky-Dink and his dog Woofer – interspersed with the in-studio antics of a host and an audience of kids. Joining host Jack Barry was Dayton Allen as Mr. Bungle, the assistant that never gets anything right. The voice of Winky-Dink was Mae Questel. And this all came to my attention when I read that Winky Dink is back. You can purchase a Winky Dink kit, complete with the magic window, crayons, and nine DVD adventures. Two other DVD volumes are currently available, each one containing nine episodes as well. I’m sure these are not being marketed to today’s kids to whom interactive means Play Station or Wii games. These are for us old timers who want to relive the simpler days of our own childhoods. Will I succumb to the allure of reliving this part of my childhood? I doubt it. You no longer can buy in for fifty cents. The kit is $24.95 and each additional DVD is $9.95. But I am glad to see that it’s available, for this indicates that there just might still be a longing for this simpler time and what it represents. But I do wonder how much different the world would be if Winky Dink was still the state of the art interactive game. How much more of a sense of wonder would today’s kids have if they had to use imagination instead of electronic stimulation to feel a sense of participation? How different would the world be if that were the case? I can’t believe that it wouldn’t be better.